The young airmail pilot logged plenty of time at the local diner. Among the earliest settlers in St. Louis, Missouri, the DeHatre family made a living running saloons. 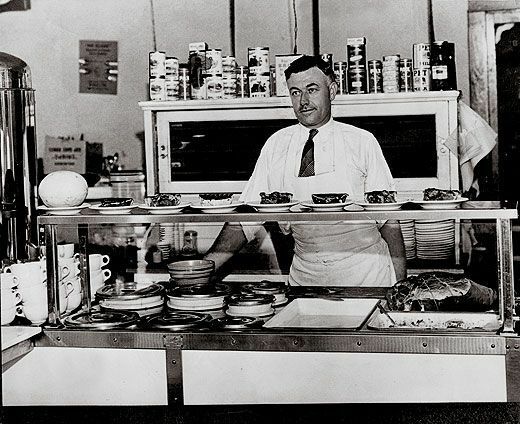 In the 1920s, Louis DeHatre opened a diner, Louie’s Place, at Lambert Field, where, in a white shirt, dark tie, and long white apron, he served hamburgers, hot dogs, eggs, steaks, pies, and other diner classics to the local military and civilian flying pioneers. On one wall, DeHatre hung pictures of pilots; on another, photos of pilots who had died. While fliers exchanged news and gossip, customers would sometimes move photos from one wall to the other, where they hung, out of place, until DeHatre discovered the prank and moved them back. Among the clientele was the young Charles Lindbergh, who had moved to St. Louis in 1925 to fly the mail between that city and Chicago. He roomed in a farmhouse a short walk from Louie’s Place, and as Kenneth Davis reported in his 1959 book, The Hero: Charles A. Lindbergh and the American Dream, he could easily put away half a dozen eggs, fried potatoes, and pork chops or a steak for breakfast, equally large lunches and dinners, and hot dogs, hamburgers, and candy in between. After securing financial backing, Lindbergh headed for Ryan Airlines in San Diego to oversee and help with the design and construction of the Spirit of St. Louis (see “A Mailplane for Lindbergh,” June/July 2011). Test flights complete, he flew the Spirit to its namesake on May 10, 1927, covering 1,500 miles in 14 hours and 25 minutes, a long-distance record. He landed at Lambert, met with his backers, and ordered ham and eggs at Louie’s. Once he had checked for news on other teams competing for the Orteig, he flew into a hornet’s nest of reporters at Curtiss Field on Long Island. After Lindbergh became the most famous person on the planet, Louie’s remained a gathering place for the aviation community. Pilots and aircraft industry figures left autographed tributes to “the hot plate king” and “the hamburger king,” noted for a “cool drink” and “swell hot dogs.” Celebrities passing through St. Louis, at a time when only the wealthy could afford commercial flying, left their photographs and autographs with DeHatre, including Will Rogers, who, with pilot Wiley Post, would die in a 1935 crash of Post’s Lockheed floatplane in Alaska. Today, the Missouri History Museum’s Louis DeHatre Collection comprises some 200 photos of fliers and their aircraft. Louie’s Place closed in the late 1930s; the site was soon built over. In the 1957 film The Spirit of St. Louis, directed by Billy Wilder (in which the diner’s role in Lindbergh’s flight was somewhat exaggerated), DeHatre was played by Jack Daly, who had walk-on roles in North by Northwest, Inherit the Wind, and The Day the Earth Stood Still. A fictional African-American short-order cook called Jesse was played by Johnny Lee, best known as lawyer Algonquin Calhoun on the TV version of “Amos ’n Andy.” Jimmy Stewart, who at 49 strained credibility playing a 25-year-old Lindbergh, explained his upcoming flight to Louie and Jesse by drawing a line from a map of the eastern United States across a wall to a knothole: Paris, he told them. Greg Bailey has written for the Economist, the Chicago Tribune, Wired, and Agence France-Presse.